I remember trying to make fudge from scratch at Christmastime just to end up, year after year, with a disgusting, burnt mess stuck to the bottom of my mom’s nice cookware. For the last few fifteen years, I’ve made fudge at Christmas using the good ole’ Eagle Brand recipe, which is basically sweetened condensed milk and chocolate chips melted together. Decent, but not like the real stuff. I’ve avoided trying many fudge recipes in my day, partially out of fear of ruining my cookware, and partially because I keep forgetting to buy a candy thermometer. 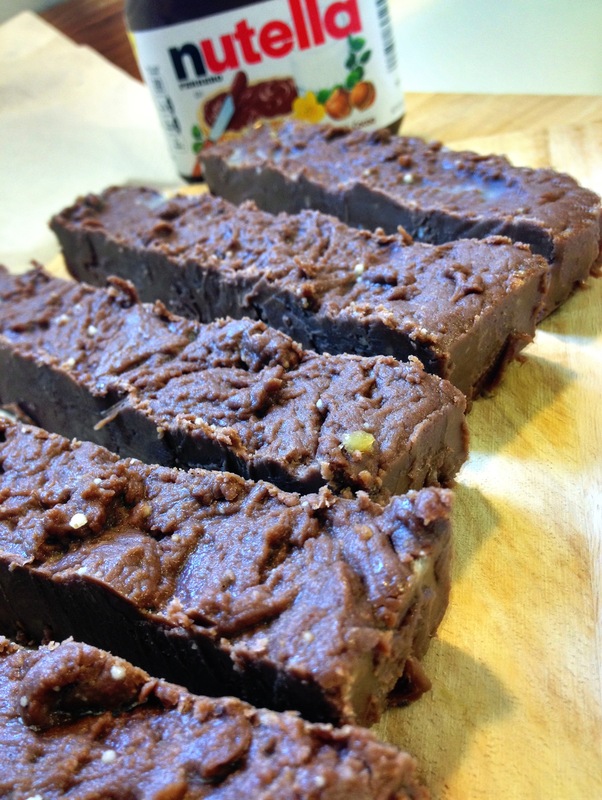 When I saw this recipe for Nutella Fudge, I was intrigued. I’ve adjusted the recipe a bit to suit my own needs, but you should head over to Not Your Momma’s Cookie to check out the original. 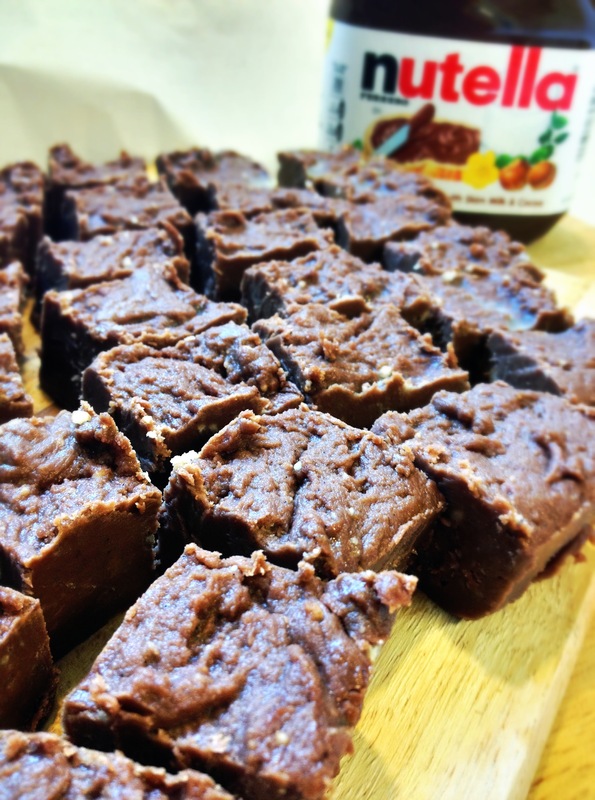 Now this recipe isn’t a classic scratch fudge recipe, either – it is something deliciously new to my world of fudge. I highly recommend that you go make it. Right now. Oh, you’re out of Nutella? Okay, well here’s a little inspiration to get you on your way to the grocery store. Oh, yeah. That’s some good fudge. Optional toppings (which I didn’t think of until after I made the batch above): chopped hazelnuts, pretzel pieces, white chocolate chips, toasted coconut, or crushed candy canes. Sift your powdered sugar into a large bowl and set aside. Line an 8×8 baking dish with parchment paper, letting the edges hang over on two opposing sides to make a sling. This makes removing and cutting the fudge a LOT easier once it has set. Melt your butter in a heavy-bottomed pot over medium heat. Add your brown sugar, vanilla bean caviar, and half-and-half and bring the mixture to a boil. Let it boil, stirring constantly, for 2 minutes. Move the pan to a cool burner and stir in the Nutella. I’d recommend spritzing your measuring cup with a little non-stick spray before putting the Nutella in there, which will make it less likely to stick. Once the Nutella is thoroughly mixed in, transfer the contents of the pot into the bowl with the powdered sugar in it. Mix quickly and thoroughly until all of it is combined. It will be pretty thick – if it seems thin, add more powdered sugar. Dump the whole mess into your baking dish and stick it in the fridge for 2 hours. Remove by grabbing the excess parchment paper and lifting. Transfer to a cutting board and cut it up! Nutella, my favorite indulgence!! This sounds so delicious!!! I can't get enough of the stuff! I highly recommend you make it when no one else is around so you can lick the bowl in solitude. I've been considering the same thing... Although the powdered sugar is the binder so I'm worried about how it would affect the texture and consistency. I think it would turn out fine, especially if you just used the cream off the top of an un-shaken can of coconut milk. 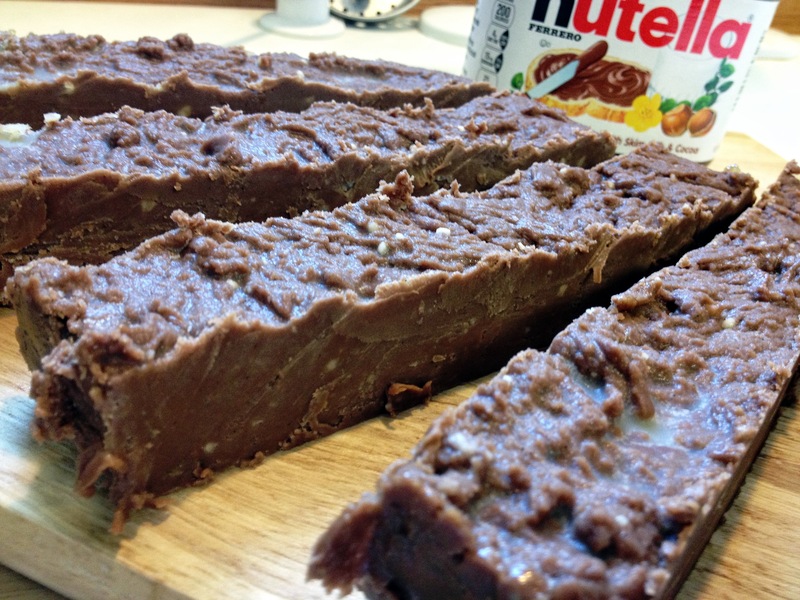 The nutella itself is already so thick and creamy it doesn't need much convincing to become fudge! I'm so glad you liked the fudge! It is so yummy - one of my favorites! I tried this for Christmas, it hasn't set up correctly. Is it supposed to be if a more Carmel constintency then true fudge? Hmm... that's so strange! Every time I've made this it has set up in fudge almost immediately and holds up just like fudge (like in the pictures). It does have a little bit more of a melt-in-your-mouth consistency than a really dense fudge, but it definitely shouldn't be like caramel. Did you make any substitutions?